Heads Over Heels regularly hold structured Portfolio events, where we invite female CEOs from high growth businesses to come and share about their business and present their ‘Asks’ to our ‘Connectors’. 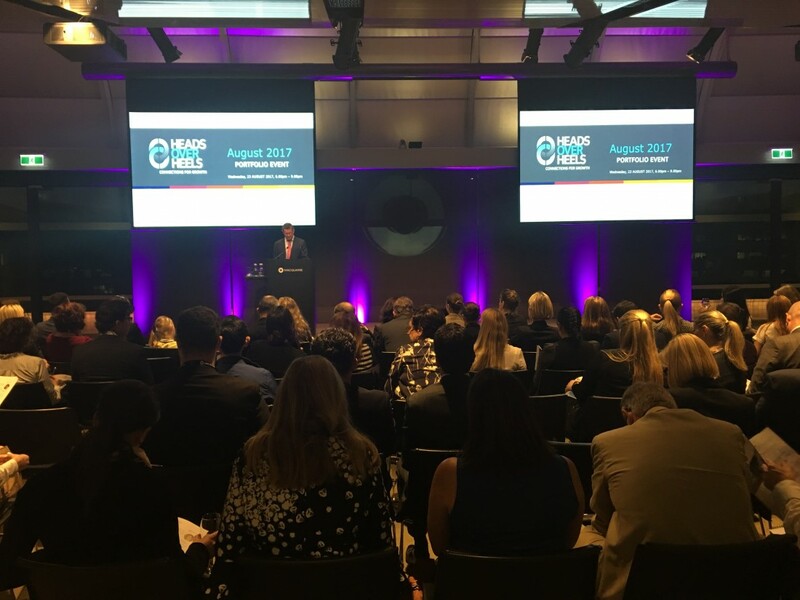 We recently held our Portfolio Event for August 2017 and recorded the presentations from the night which you can view below. FreightExchange is an online logistics platform offered interstate freight transport via road, rail, sea and air services and solutions across Australia. Cate has spent over 15 years delivering strategic IT and data driven projects in multiple industries. She founded FreightExchange to help long-distance freight transport businesses sell their unused capacity. Cate is passionately focused on using data science and technology to create innovative programs of work that drive measurable change for industry. Prior to starting FreightExchange, Cate founded c8consulting, she was the Oceania Practice Lead for Forensic Data Analytics at EY, and held roles across customer analytics and directing marketing at CBA and Citibank. Sheholds an EMBA from AGSM, a BA (Mathematics, Psychology) from University of Queensland and is also a Member of the International Institute for Analytics. Freightexchange was also recently awarded a $100k Building Partnership from Jobs for NSW. FlexCareers is a disruptive online talent matching platform connecting talented women with progressive employers offering flexible work. Natalie is driven by making a difference in this world, through her passion for creating economic empowerment for women. She has over 20 years experience across numerous landscapes including being an entrepreneur, corporate, Government and Not For Profit – particularly in technology, HR, learning and development and organisational psychology. FlexCareers, is a disruptive online talent matching platform connecting talented people with progressive employers offering flexible work. Natalie sits on a number of boards including the Women’s Indigenous Network and Global Sisters. And is also an Advisor on the Blue Chilli #SheStarts Program and Supporter of the Springboard SBE Program. She is a believer of challenging the norm, being curious and innovating, finding better and different ways of doing things, of connecting and collaborating. Expense Manager an Australian software company that was developed to empower businesses to dramatically improve the way they manage their spend, by automating their expense and invoice process and make it paper free. Sharon has worked in the travel technology domain for many years with expertise in software design, development and market release of online travel technology solutions. Sharon’s entreprenurial spirit started with the inception of corporate travel agencies in both Sydney and Adelaide and subsequent merger with Australia’s first online travel company, travel.com.au. Sharon is a technology thrill seeker and passionate about taking an idea from concept to creation to market release. She believes cloud software has been the catalyst for change for many companies and is passionate about new and innovative processes that help make a positive environmental impact by eliminating paper. Switch Automation is a smart building platform that connects to disjointed solutions (regardless of hardware); collects data; and provides a unified user interface to analyse building performance, employ fault detection and diagnostics, and execute real-time control and command. Deb Noller is a disruptive innovator and sustainability leader in smart building technology. As the CEO of Switch Automation, she created a scalable enterprise SaaS solution for building owners and operators that leverages IoT to analyse, automate and control real estate assets in real-time. Under Noller’s leadership, Switch has grown from a Sydney-born company into a global organization with a large North America presence. Currently 8,000+ buildings are increasing their ROI through energy efficiency, fault detection and diagnostics on the Switch Platform. With more than 20 years of experience in technology, computer science, business, efficiency and sustainability, Noller passionately employs her expertise to help large portfolio managers use technology to execute smarter business operations. By shifting the question from “How much did we spend” to “How much did we save?” Noller is fundamentally changing the way facilities professionals solve ROI problems. After founding 5 successful companies, Noller was named a Top 50 Female Entrepreneur in Australia by Rare Birds; is an advisor to Realcomm to push the smart building industry forward; and speaks at some of the most innovative events and conferences around the world, such as Green Cities, Microsoft Ignite, and Google Fireside Chats.